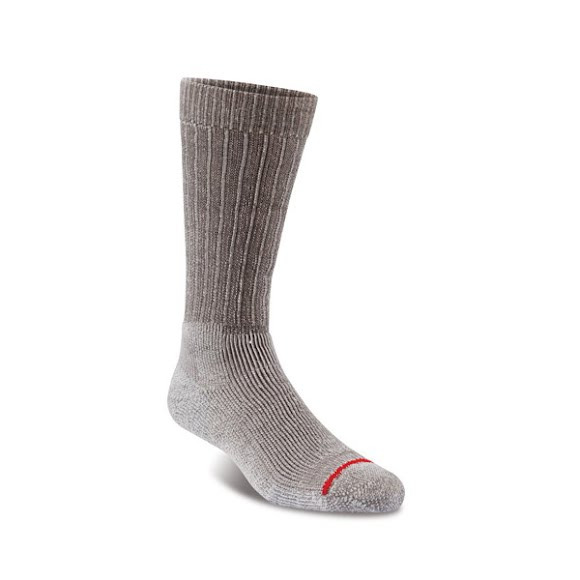 Featuring ample support, warmth and comfort, Fits Socks' Big Game Sock is built to keep up with the demands of travel over rough terrain in inclement weather. Featuring ample support, warmth and comfort, Fits Socks &apos; Big Game Sock is built to keep up with the demands of travel over rough terrain in inclement weather. Heavyweight design with extra cushioning surrounding your entire foot, ankle, and calf. Double-welted top so the sock always stays up and doesnÕt bind or slip. Color-coded seam on toe and indicator inside welt so you wonÕt forget your size. Dynamic Toe Cup - contours to the shape of your toes. Heel Lock - super deep heel pocket with ample cross stretch locks the sock on your heel. Full Contact Cuff - stays in place due to a tighter ankle and looser calf (proper gradience).